Marie-Madeleine de La Vieuville was born on 6 October 1693 in Paris; she was the only child of René-Francois de La Vieuville and Marie Louise de La Chaussee d'Eu. 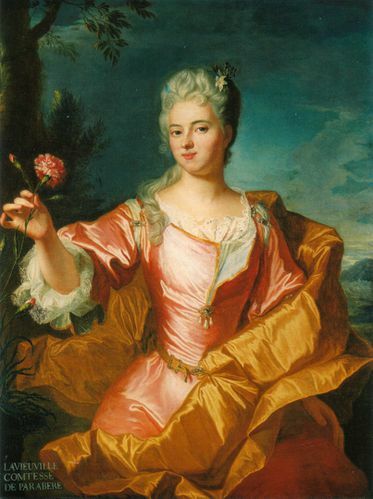 Through her parents she already had a clear connection to the court; her father was a knight of honour to Queen Marie Thérèse and her mother was a lady-in-waiting to the Duchesse de Berri. Although her family had long been a part of the nobility it was a poor house. Consequently, it became necessary to find a husband who could provide well for Marie Madeleine. In her case the choice of a bridegroom would be a mixed affair; on one hand Marie-Madeleine was beautiful and the daughter of a Marquis but on the other she was poor and could only bring a little dowry. In the end an arrangement was made with Caesar-Alexandre de Baudéan, Marquis de Parabère and the couple married on 8 June 1711. Marie-Madeleine had mixed feelings about her marriage. Her husband was 30 years her senior and had little to no ambition for himself. He was, however, from one of the very best families in Poitou. In the end the marriage would be very typical of arranged marriages: little affection on both sides. Marie-Madeleine was the type of woman who would be described as "high spirited"; she wanted far more amusement that her disinterested husband could provide and thus sought out her place at court. However, there was another obstacle in her way in the shape of her mother. Marie Louise was all too aware of her daughter's pendant to a "wild" type of lifestyle and wanted to prevent her becoming a court flirt. In 1715 two deaths would have profound influence on Marie-Madeleine's life. First, her mother died after having suffered from breast cancer. There was now no one to stand in her way of pursuing pleasure. Secondly, Louis XIV died which meant a change in regime - and an opportunity to rise in the world. Without the restraining influence of her mother Marie-Madeleine indulged in several affairs including one with the Chevalier de Matignon. It was soon said of the young Marquise that she was "crazy about her freedom". In this manner she spent her time at court until she was a widow. Her husband died just the year after but Marie-Madeleine did not mourn him. Despite their long time apart they had still managed to have three children together. By now she was 23 years old and infamous for her way of charming every man she met. She reached quite a level of fame in the French capital where she became the subject of songwriters. Such a lady was soon discovered by the most scandalous woman in France: the Duchesse de Berri. It was through her that Marie-Madeleine met Philippe II d'Orléans who acted as Regent during Louis XV's minority. The two seemed to be made for each other and soon became lovers. Their affair was one of insatiable pleasures and lavish extravagance. Marie-Madeleine was a firm fixture in the infamous supper parties of the Regent where she drank everyone under the table. She soon became both admired and despised for her way of life - it was said that she needed only one hour of sleep before she could resume the life of a royal mistress. 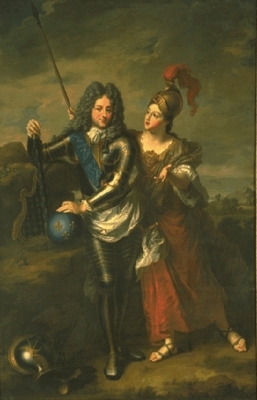 Neither Marie-Madeleine nor Philippe were exclusive in their love for each other. The Regent had a string of minor mistresses but Madame de Parabère remained a fixture in his life. Marie-Madeleine also had an affair with the Duc de Richelieu with whom she was absolutely in love with. Sadly, her love was not returned and she is not mentioned at all in his memoirs. Although not being faithful himself the Regent was furious at having a rival but forgave his darling - only for her to cheat on him again. Marie-Madeleine had determined not to be held back in her pleasures as she had once been before. Her flings with other men meant that the children she had by the Regent was not acknowledged. He did give her a country estate in Asnieres where he would visit on orders from his doctors. Soon, Marie-Madeleine was pregnant again - and so was the Duchesse d'Orléans, her lover's wife. Marie-Madeleine was the only woman who ever had any political influence during the Regency. Philippe knew very well that she was not interested in gaining power so he was welcoming her advice. The couple suffered a rupture in November 1720 and most people thought that that would be the end of Madame de Parabère's reign. However, Marie-Madeleine and Philippe made up soon after and she was back more powerful than ever. But the damage between them was done. Marie-Madeleine was tired of hearing of all the Opera girls going to and fro her lover's bedroom and decided to leave him. Instead, she went to the country to repent her sins in a convent. She was rather devout despite her lifestyle which she had not given up. After all she had not taken the veil and still had many affairs to come. The affairs of her later years included Monsieur d'Alincourt and Monsieur de La Mothe-Houdancourt. None of these relationships lasted for long. The final years of her life are shrouded in mystery. There were talk of her marrying the Duc de Brancas but the match never materialised. In 1739 she completely retired from the world and would die on 13 August 1755.